← Brie Cheese & Garlic Bread Melt……. This is a great mixer for both alcoholic and non alcoholic drinks. It’s tart, sweet, festive, refreshing. Such a pretty drink too. I really should have posted this before Christmas, as it is so festive looking. I made this mix to make a margarita. But it is really good with vodka or even non alcoholic beverages! Seriously, it is a keeper recipe. 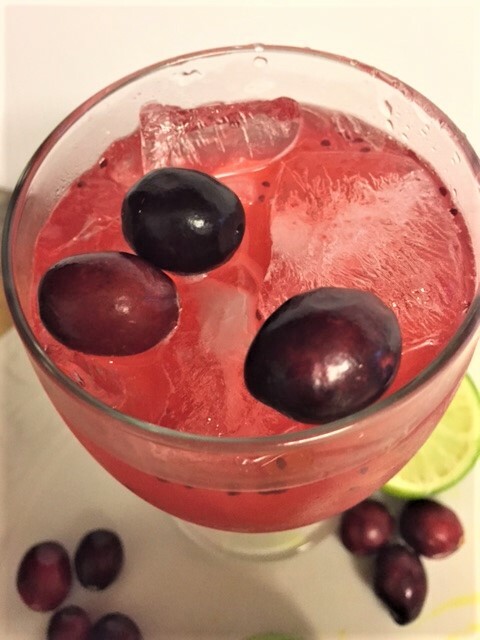 When I made it, I had 3 separate mixers….cranberry mix, simple syrup and the lime juice. I just mixed a little of each into my tequila, since I was just making one drink. 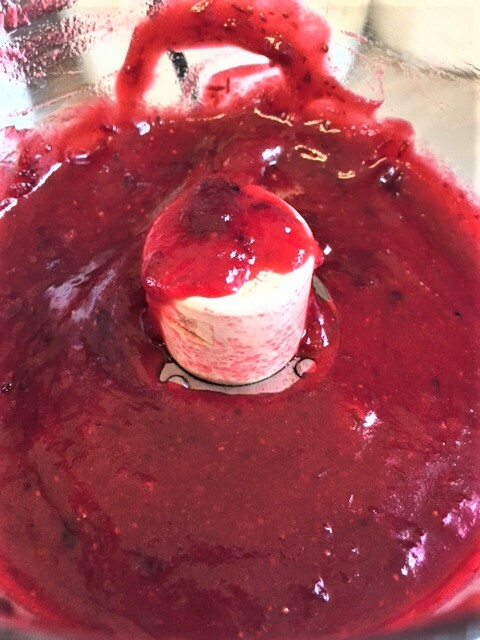 But if you are serving several, just combine multiple amounts of the mixer ingredients to make a batch. Then you can just add it to your liquor of choice, . Much easier. I did that after the one drink for future drinks. Easy preparation, for when I get a hankerin’ for a drink. Hankerin….I like that word. Now, you know I love spicy. So when I made the simple syrup, I infused it with fresh ginger and jalapeno. HOLY CRAP is it ever tasty. It’s not overly hot….it won’t turn your face red and make you break out in a sweat. It’s just enough heat that you get a little hint of. Trust me, it’s great, but you certainly don’t have to add the jalapeno. Of course, by now, you know I am a huge fan of fresh ginger. But you don’t have to use that either. Just a wee bit of info for ya, on simple syrups. It’s just a mixture of equal parts water and sugar, heated. That’s it! It’s great to use in cocktails, or iced tea. Much better than sugar since you don’t have to wait for the granules to dissolve. I also brush it on my cakes and cupcakes, pound cakes etc. It adds a sweetness and a moisture to baked goods. Hmmm, I think I will do a separate blog post on all things simple syrup. 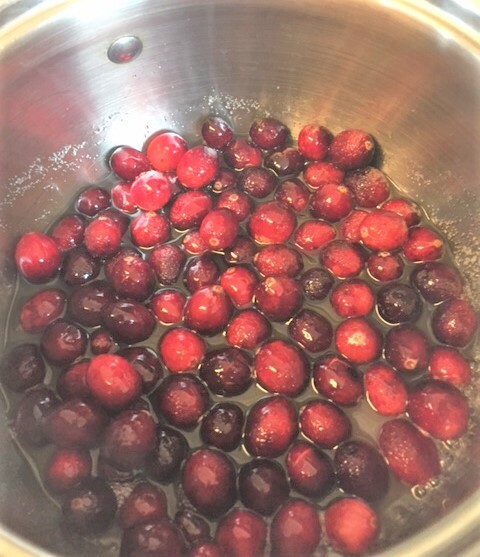 Place the cranberries and the water in a medium sized sauce pan, over medium heat. Stir. 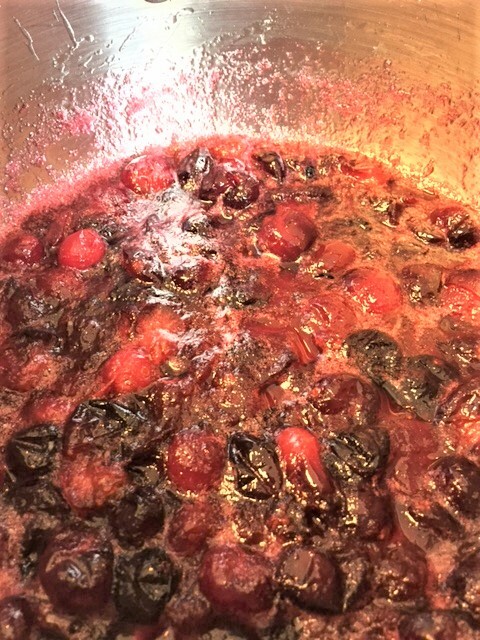 Once the cranberries have burst open, they should start to thicken up to a beautiful, colorful mixture. Remove from heat and put them in a food processor. Pulse, pulse. At this point, you can either strain them through a sieve if you just want the juice, but I leave them as is, with some texture. Set aside to cool. It will thicken, but that’s ok. Simple Syrup: In a sauce pan, mix 1 cup sugar with 1 cup water. Add a 2″ size chunk of fresh, peeled ginger, sliced and half of a sliced jalapeno. (optional) Set aside to cool. 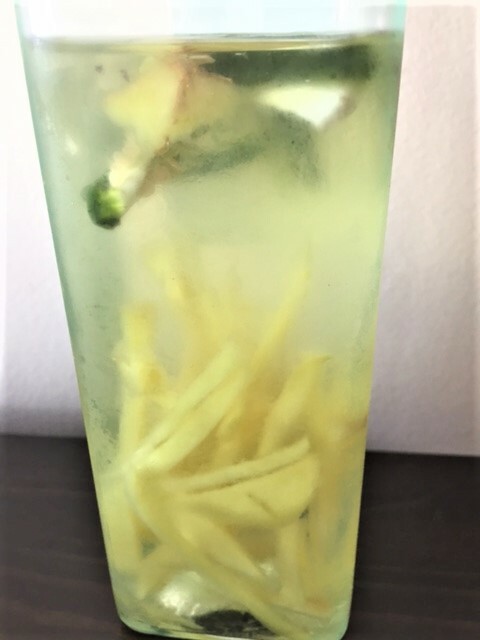 Pour into a glass container with the ginger and jalapeno. You may want to remove the jalapeno at this point, as it will continue to get spicy as you store it. Mix or shake cranberry mix, simple syrup, lime juice and liquor together. Pour over ice and drink! 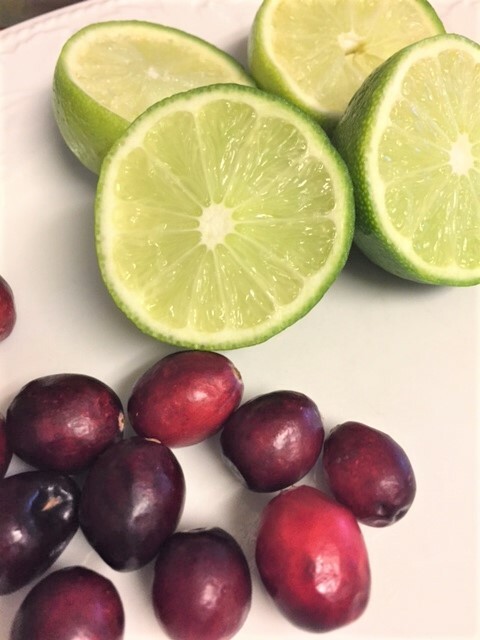 Mix the cranberry mix, simple syrup, lime juice together. Add to beverage, according to taste. So refreshing!